She has a way of teaching that goes way beyond exercise or stretching. In the four years that I have been a student in Leena’s classes, I have learned a tremendous amount about myself and my body and have committed to yoga as an essential element of both my health and spiritual practice. In addition to being my twice weekly yoga teacher, Leena is now a helpful voice (and what a beautiful voice it is) in my head–wisely and gently guiding, reminding, and prodding with the many witticisms, insights and words to live by that she shares. I have gone through a significant job change, a serious health crisis, and difficult family challenges during my time as her student and I can honestly say that taking yoga from Leena has been key to not just getting through it but to learning from it and living more fully through it. I attribute my current devotion to yoga to Leena’s skill as a teacher. While traveling for work I have sought out yoga classes elsewhere to keep my practice going and have learned from those experiences how unique Leena is and how much I value her particular approach to teaching yoga. For other teachers, yoga is an exercise class–as intense as the rest of the day that I want to leave behind temporarily and is about correct posture and achievement. For Leena, yoga is an exploration–of what your body can do (often with props and other modifications! ), of where it stops and everything else begins, of breathing, of spaces between breaths, and of what a room of suburban practitioners can do to change the world as well as themselves when they practice yoga–as asana, as breathing practice, and as way of life. 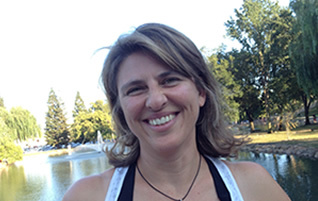 “As a yoga teacher, Leena uses careful instructions and clear visual demonstrations, humor, her own experience and growth as a yogi, body education (anatomy & physiology), gentle touch (and respectfully only with your permission), and many props and modifications to help students visualize and then practice the yoga, breathing and mindfulness that are all a part of her classes. Edie Sparks, PhD is an Associate Professor of History at the University of the Pacific, a private, comprehensive, national university in the Central Valley of California. She specializes in the history of women in business and is the author of Capital Intentions: Female Proprietors in San Francisco, 1850-1920. In her second book project, she is examining the history of three women who founded manufacturing companies in the U.S. during the 1930s and recognized as leading executives by the 1960s and 70s when all of them became the first female board members of the corporations to which they sold their companies. A special interest of Dr. Sparks is nurturing women’s leadership. This grows out of both her scholarship and experience while Senior Associate Dean at Pacific for six years. She enjoys traveling, watching movies and laughing with her two young daughters and husband and entertaining friends. Walking, yoga and volunteer work help her keep things in perspective. career, crisis, Danville, life coach, yoga.